Laikipia County is one of the 47 counties of Kenya, located on the Equator in the former Rift Valley Province of the country. The county has two major urban centres: Nanyuki to the southeast, and Nyahururu to the southwest. Its capital is Rumuruti. Economic activity in the county consists mainly of tourism and agriculture, chiefly grain crops, ranching and greenhouse horticulture. The county encompasses the high, dry Laikipia Plateau, and has a cool, temperate climate with both rainy and dry seasons. Opposition leader Raila Odinga has promised to dismantle white-owned ranches in Laikipia to prevent chaos if he wins the August 8 general elections. Ranches in parts of Laikipia county have been experiencing invasions, leading to violent confrontations between herders and owners. “These ranches are too big and the people don’t even live there; they live in Europe and only come once in a while,” he told The Times. “There’s need for rationalisation to ensure there’s more productive use of that land." Raila blamed the violent land invasions on the ranchers and the Jubilee government’s failure to manage them better. Champions Trophy 2017 made Indian fans distraught ! – we lost in the 8 Nation finals – but that loss to Pakistan rankles and immediately Indians are off to playing One dayers with WI who had not even qualified and were playing Afganisthan only recently. At Oval, Sunday, India lost a match in which they were firm favourites –nothing went in their favour, though the toss was won and put in. Pak considered to a weak batting line-up amassed runs and the first break through came only through a run-out, if we are to omit that no-ball caught behind. Newbie opener Fakhar Zaman, playing his fourth international innings, hit 114 from 106 balls in one of the highest-pressure cricket matches of the decade, before a bristling middle order grew the total to 338 for 4, with the kind of power and skill which not even their mothers would have suspected they possessed. Then moments later, Mohammad Amir decapitated the India innings in a scintillating opening burst that brought him the scalps of each of the top three, and then by the middle of the 14th over, India would be 54 for 5, the trophy basically handed over. Shadab Khan insisted on an excellent review that found Yuvraj to be plumb in front of the stumps. Hardik Pandya fired on all cylinders though it never seemed that Indians were with any fighting chance. The game sadly was all over in the 31st over. Now Cricket fans can take solace in the five-match One-day International (ODI) series against West Indies which starts on June 23 in Trinidad and Tobago. The Windies will play with an unchanged squad from the last series against Afghanistan. This means there will be no place for the likes of Chris Gayle, Dwayne Bravo and Kieron Pollard. The Men in Blue will be without Rohit Sharma and Jasprit Bumrah being rested. Miles away, England played another game of cricket – it was against an African tribe known for their hunting culture and proud warrior traditions. The Maasai tribesmen of southern Kenya put down their spears and shown the world that they are just as skillful with cricket bats. 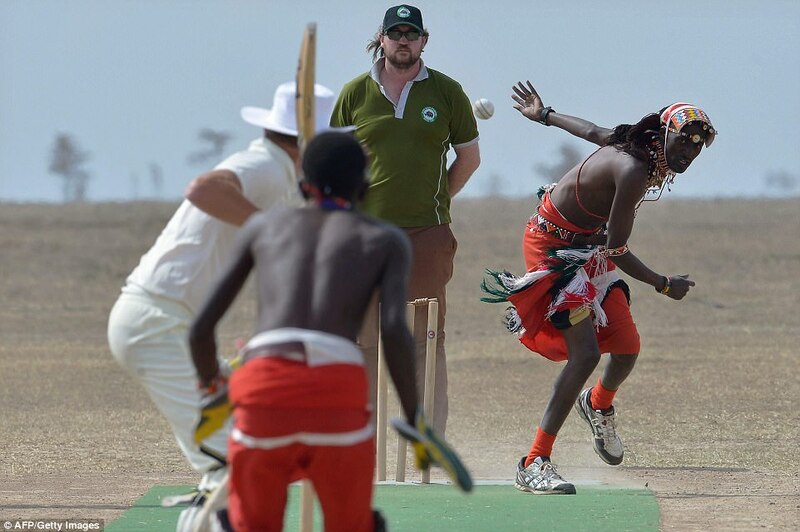 A group of warriors played against the British Army Training Unit (BATUK) as part of a cricket tournament in the wilds of Laikipia county, southern Kenya. The two-day tournament, dubbed 'Last Male Standing' is an annual charity event the aims to raise awareness for the plight of the northern white rhino. Widespread poaching has destroyed much of Africa's rhino population. In the 1960s there were roughly 2,300 northern white rhinos left in the public . By 1984 that number had dwindled to 15. 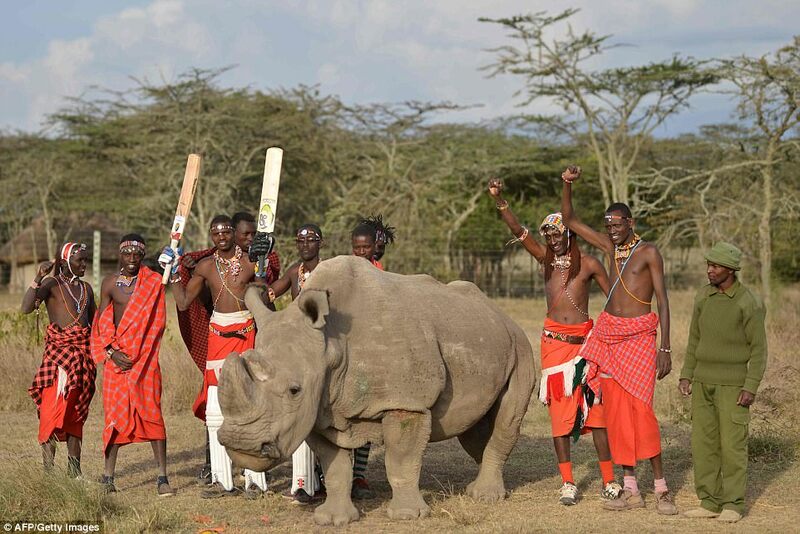 Today, the only remaining male northern white rhino is found at the 90,000 acre Ol-Pejeta Conservancy, where the cricket tournament was held. Sudan, 43, has to be protected round-the-clock by armed guards, because poachers are determined to take his ivory horn. In a publicity stunt, Sudan recently 'joined' Tinder, as a way to help raise $9 million towards breeding methods. The money raised by the 'Last Male Standing' event will also go towards ongoing research as a way to save the species from extinction.